No response, Posted by: Evan Agee on Tue, 24 Aug 2010 16:01:28 +0000 in Podcast Episodes. No response, Posted by: Evan Agee on Fri, 28 May 2010 04:00:52 +0000 in Podcast Episodes. No response, Posted by: Evan Agee on Fri, 28 May 2010 00:01:22 +0000 in Podcast Episodes. No response, Posted by: Evan Agee on Mon, 24 May 2010 15:17:29 +0000 in Podcast Episodes. No response, Posted by: Evan Agee on Tue, 18 May 2010 18:01:44 +0000 in Podcast Episodes. No response, Posted by: Evan Agee on Fri, 14 May 2010 13:21:40 +0000 in Podcast Episodes. No response, Posted by: Evan Agee on Fri, 07 May 2010 03:57:56 +0000 in Podcast Episodes. No response, Posted by: Evan Agee on Thu, 08 Apr 2010 02:55:58 +0000 in Podcast Episodes. No response, Posted by: Evan Agee on Thu, 25 Mar 2010 05:30:32 +0000 in Podcast Episodes. No response, Posted by: Evan Agee on Thu, 18 Mar 2010 04:53:07 +0000 in Podcast Episodes. No response, Posted by: Evan Agee on Fri, 12 Mar 2010 00:32:24 +0000 in Podcast Episodes. No response, Posted by: Evan Agee on Thu, 04 Mar 2010 02:19:49 +0000 in Podcast Episodes. No response, Posted by: Evan Agee on Thu, 25 Feb 2010 01:07:39 +0000 in Podcast Episodes. No response, Posted by: Evan Agee on Wed, 17 Feb 2010 19:41:12 +0000 in Podcast Episodes. No response, Posted by: Evan Agee on Wed, 10 Feb 2010 15:58:41 +0000 in Podcast Episodes. No response, Posted by: Evan Agee on Thu, 04 Feb 2010 00:01:23 +0000 in Podcast Episodes. No response, Posted by: Evan Agee on Wed, 03 Feb 2010 06:16:08 +0000 in Podcast Episodes. Evan taking part in S6 premiere discussion tonight! No response, Posted by: Evan Agee on Tue, 02 Feb 2010 16:31:17 +0000 in Podcast Episodes. LOST season premiere on Groundhog Day, coincidence? No response, Posted by: Evan Agee on Tue, 19 Jan 2010 16:32:26 +0000 in Podcast Episodes. No response, Posted by: Evan Agee on Mon, 18 Jan 2010 20:40:20 +0000 in Podcast Episodes. A big hint from Josh Holloway? No response, Posted by: Evan Agee on Thu, 14 Jan 2010 16:49:18 +0000 in Podcast Episodes. No response, Posted by: Evan Agee on Fri, 08 Jan 2010 10:00:00 +0000 in Podcast Episodes. No response, Posted by: Evan Agee on Mon, 04 Jan 2010 18:56:27 +0000 in Podcast Episodes. Vote for us on PodcastAwards.com! No response, Posted by: Evan Agee on Mon, 05 Oct 2009 22:28:01 +0000 in Podcast Episodes. Anton and Evan on LOSTies! No response, Posted by: Evan Agee on Mon, 17 Aug 2009 13:30:47 +0000 in Podcast Episodes. No response, Posted by: Evan Agee on Mon, 03 Aug 2009 13:06:49 +0000 in Podcast Episodes. No response, Posted by: Evan Agee on Wed, 29 Jul 2009 13:52:50 +0000 in Podcast Episodes. No response, Posted by: Evan Agee on Wed, 29 Jul 2009 03:30:11 +0000 in Podcast Episodes. Lost Mystery Podcast Episode 98: What’s next for Lost, Comic-Con, and more! No response, Posted by: Evan Agee on Sun, 19 Jul 2009 21:06:01 +0000 in Podcast Episodes. A quick update, yes we’re still alive! No response, Posted by: Evan Agee on Wed, 08 Jul 2009 17:45:55 +0000 in Podcast Episodes. No response, Posted by: Evan Agee on Sun, 14 Jun 2009 01:00:58 +0000 in Podcast Episodes. No response, Posted by: Evan Agee on Wed, 03 Jun 2009 10:00:39 +0000 in Podcast Episodes. No response, Posted by: Evan Agee on Sun, 31 May 2009 10:00:47 +0000 in Podcast Episodes. No response, Posted by: Evan Agee on Fri, 29 May 2009 10:00:48 +0000 in Podcast Episodes. No response, Posted by: Evan Agee on Wed, 27 May 2009 10:00:31 +0000 in Podcast Episodes. No response, Posted by: Evan Agee on Sun, 24 May 2009 10:00:46 +0000 in Podcast Episodes. No response, Posted by: Evan Agee on Fri, 22 May 2009 10:00:35 +0000 in Podcast Episodes. No response, Posted by: Evan Agee on Wed, 20 May 2009 10:00:44 +0000 in Podcast Episodes. No response, Posted by: Evan Agee on Sun, 17 May 2009 10:00:44 +0000 in Podcast Episodes. No response, Posted by: Evan Agee on Fri, 15 May 2009 10:00:29 +0000 in Podcast Episodes. No response, Posted by: Evan Agee on Wed, 13 May 2009 10:00:48 +0000 in Podcast Episodes. No response, Posted by: Evan Agee on Sun, 10 May 2009 10:00:41 +0000 in Podcast Episodes. No response, Posted by: Evan Agee on Fri, 08 May 2009 10:00:31 +0000 in Podcast Episodes. No response, Posted by: Evan Agee on Wed, 06 May 2009 10:00:50 +0000 in Podcast Episodes. No response, Posted by: Evan Agee on Sun, 03 May 2009 19:15:53 +0000 in Podcast Episodes. No response, Posted by: Evan Agee on Sun, 03 May 2009 11:14:06 +0000 in Podcast Episodes. No response, Posted by: Evan Agee on Fri, 01 May 2009 10:00:01 +0000 in Podcast Episodes. No response, Posted by: Evan Agee on Wed, 29 Apr 2009 10:00:44 +0000 in Podcast Episodes. No response, Posted by: Evan Agee on Sun, 26 Apr 2009 10:00:04 +0000 in Podcast Episodes. No response, Posted by: Evan Agee on Fri, 24 Apr 2009 10:00:25 +0000 in Podcast Episodes. No response, Posted by: Evan Agee on Wed, 22 Apr 2009 10:00:18 +0000 in Podcast Episodes. No response, Posted by: Evan Agee on Sun, 19 Apr 2009 11:00:38 +0000 in Podcast Episodes. No response, Posted by: Evan Agee on Fri, 17 Apr 2009 12:35:10 +0000 in Podcast Episodes. No response, Posted by: Evan Agee on Wed, 15 Apr 2009 13:02:03 +0000 in Podcast Episodes. No response, Posted by: Evan Agee on Sun, 12 Apr 2009 11:00:47 +0000 in Podcast Episodes. No response, Posted by: Evan Agee on Fri, 10 Apr 2009 11:00:03 +0000 in Podcast Episodes. No response, Posted by: Evan Agee on Wed, 08 Apr 2009 11:00:10 +0000 in Podcast Episodes. No response, Posted by: Evan Agee on Sun, 05 Apr 2009 11:00:43 +0000 in Podcast Episodes. No response, Posted by: Evan Agee on Fri, 03 Apr 2009 11:00:56 +0000 in Podcast Episodes. No response, Posted by: Evan Agee on Wed, 01 Apr 2009 11:00:11 +0000 in Podcast Episodes. No response, Posted by: Evan Agee on Mon, 30 Mar 2009 14:36:45 +0000 in Podcast Episodes. No response, Posted by: Evan Agee on Sun, 29 Mar 2009 11:00:00 +0000 in Podcast Episodes. No response, Posted by: Evan Agee on Fri, 27 Mar 2009 11:00:38 +0000 in Podcast Episodes. No response, Posted by: Evan Agee on Wed, 25 Mar 2009 11:00:51 +0000 in Podcast Episodes. No response, Posted by: Evan Agee on Sun, 22 Mar 2009 11:00:06 +0000 in Podcast Episodes. Lost Mystery Podcast Episode 64: Lost S3 – D.O.C. No response, Posted by: Evan Agee on Fri, 20 Mar 2009 11:00:08 +0000 in Podcast Episodes. No response, Posted by: Evan Agee on Wed, 18 Mar 2009 11:00:23 +0000 in Podcast Episodes. No response, Posted by: Evan Agee on Sun, 15 Mar 2009 11:00:50 +0000 in Podcast Episodes. LOST Mystery Podcast Forums are OPEN! No response, Posted by: Evan Agee on Fri, 13 Mar 2009 15:07:45 +0000 in Podcast Episodes. No response, Posted by: Evan Agee on Fri, 13 Mar 2009 11:00:39 +0000 in Podcast Episodes. No response, Posted by: Evan Agee on Wed, 11 Mar 2009 11:00:16 +0000 in Podcast Episodes. No response, Posted by: Evan Agee on Sun, 08 Mar 2009 11:00:13 +0000 in Podcast Episodes. No response, Posted by: Evan Agee on Fri, 06 Mar 2009 11:00:51 +0000 in Podcast Episodes. No response, Posted by: Evan Agee on Wed, 04 Mar 2009 11:00:12 +0000 in Podcast Episodes. No response, Posted by: Evan Agee on Sun, 01 Mar 2009 11:00:28 +0000 in Podcast Episodes. No response, Posted by: Evan Agee on Fri, 27 Feb 2009 11:00:47 +0000 in Podcast Episodes. No response, Posted by: Evan Agee on Wed, 25 Feb 2009 13:50:35 +0000 in Podcast Episodes. No response, Posted by: Evan Agee on Wed, 25 Feb 2009 11:00:02 +0000 in Podcast Episodes. A quick call for Video Voicemails! No response, Posted by: Evan Agee on Mon, 23 Feb 2009 13:51:27 +0000 in Podcast Episodes. No response, Posted by: Evan Agee on Sun, 22 Feb 2009 11:00:19 +0000 in Podcast Episodes. No response, Posted by: Evan Agee on Fri, 20 Feb 2009 11:00:13 +0000 in Podcast Episodes. No response, Posted by: Evan Agee on Wed, 18 Feb 2009 11:00:50 +0000 in Podcast Episodes. No response, Posted by: Evan Agee on Sun, 15 Feb 2009 11:00:11 +0000 in Podcast Episodes. No response, Posted by: Evan Agee on Fri, 13 Feb 2009 15:26:55 +0000 in Podcast Episodes. No response, Posted by: Evan Agee on Fri, 13 Feb 2009 13:50:24 +0000 in Podcast Episodes. No response, Posted by: Evan Agee on Wed, 11 Feb 2009 11:00:31 +0000 in Podcast Episodes. No response, Posted by: Evan Agee on Sun, 08 Feb 2009 11:00:55 +0000 in Podcast Episodes. No response, Posted by: Evan Agee on Sun, 08 Feb 2009 01:37:53 +0000 in Podcast Episodes. No response, Posted by: Evan Agee on Sun, 08 Feb 2009 01:00:47 +0000 in Podcast Episodes. No response, Posted by: Evan Agee on Fri, 06 Feb 2009 11:00:47 +0000 in Podcast Episodes. No response, Posted by: Evan Agee on Wed, 04 Feb 2009 11:00:57 +0000 in Podcast Episodes. LOST Mystery Podcast Facebook Group! No response, Posted by: Evan Agee on Tue, 03 Feb 2009 15:55:21 +0000 in Podcast Episodes. Lost Mystery Podcast Episode 44: Lost S2 – ? No response, Posted by: Evan Agee on Sun, 01 Feb 2009 11:00:52 +0000 in Podcast Episodes. No response, Posted by: Evan Agee on Fri, 30 Jan 2009 11:00:41 +0000 in Podcast Episodes. Lost Mystery Podcast Episode 42: Lost S2 – S.O.S. No response, Posted by: Evan Agee on Wed, 28 Jan 2009 11:00:06 +0000 in Podcast Episodes. No response, Posted by: Evan Agee on Sun, 25 Jan 2009 11:00:03 +0000 in Podcast Episodes. No response, Posted by: Evan Agee on Fri, 23 Jan 2009 11:00:03 +0000 in Podcast Episodes. No response, Posted by: Evan Agee on Wed, 21 Jan 2009 11:00:00 +0000 in Podcast Episodes. No response, Posted by: Evan Agee on Sun, 18 Jan 2009 11:00:40 +0000 in Podcast Episodes. No response, Posted by: Evan Agee on Fri, 16 Jan 2009 11:00:55 +0000 in Podcast Episodes. No response, Posted by: Evan Agee on Fri, 31 Dec 2008 11:00:55 +0000 in Podcast Episodes. No response, Posted by: Evan Agee on Fri, 28 Dec 2008 11:00:55 +0000 in Podcast Episodes. No response, Posted by: Evan Agee on Fri, 26 Dec 2008 11:00:55 +0000 in Podcast Episodes. No response, Posted by: Evan Agee on Fri, 24 Dec 2008 11:00:55 +0000 in Podcast Episodes. No response, Posted by: Evan Agee on Fri, 21 Dec 2008 11:00:55 +0000 in Podcast Episodes. 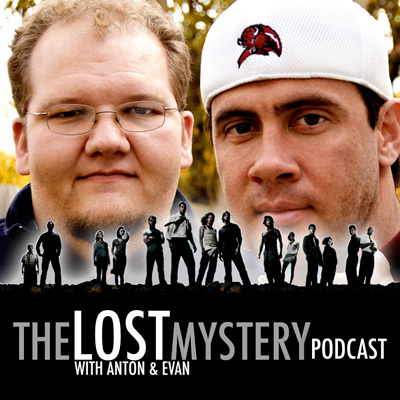 Anton and Evan sit down to discuss The End of LOST... and try not to break down crying in the process. See you in another life brothas! Lost Mystery Podcast Episode 98: Whats next for Lost, Comic-Con, and more! A quick update, yes were still alive!